RIO DE JANEIRO — Great Britain’s Mo Farah used a 4:02 final 1600 and 55-second last lap to close off a 13:11 final 5000 and become the fifth man in history to successfully defend his Olympic 10,000-meter crown by running 27:05.17. Kenya’s Paul Tanui moved up a spot from his runs at the 2013 and 2015 World Championships and got the silver (27:05.64) as Ethiopia’s Tamirat Tola was third (27:06.26). American Galen Rupp, who won the silver medal behind his training partner Farah four years ago, was in a contention for a medal, as he has so often been in recent years, until the final 300. He ended up fifth in 27:08.92. Farah won despite falling early in the race after being clipped by Rupp. Recap below, followed by analysis. Conditions were good for running at the Olympic Stadium as it was 66 degrees with some light wind at the start of the race. 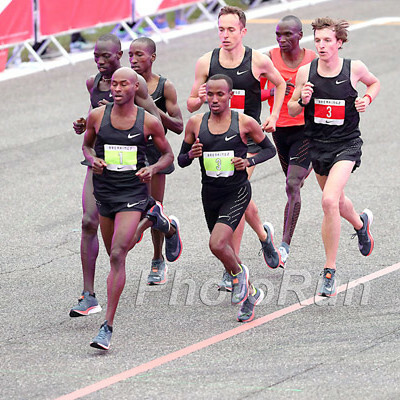 2015 Worlds silver medallist Geoffrey Kamworor, whom many assumed would be the biggest threat to Farah, blasted off the line into the lead, and by 400 meters (67.2), Tanui and Kamworor were running at the front of the pack, with Rupp right behind them. 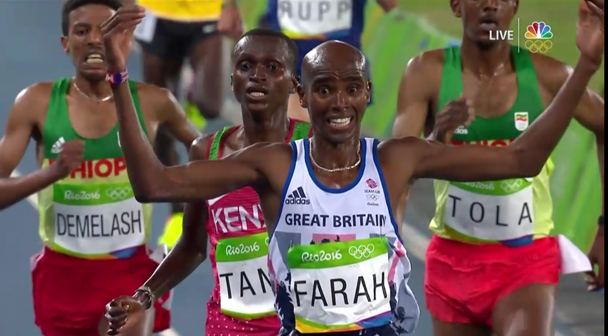 Farah felt no need to rush and was in dead last, even waving to the crowd as he ran on the first lap. The biggest question coming in was whether the Kenyans would echo their team tactics of a year ago in Beijing in an attempt to drop Farah before the final lap. We got our answer early as the pace slowed to 71’s for laps two and three and 1600 was hit in just 4:37 (28:51 pace). The pace picked up slightly on the fifth lap (66.5), and during the third kilometer, Farah finally decided he’d had enough of running in last place and made his way up to the front of the pack. Just before 2800 meters, Farah took the lead and tried to slow the pace down, but Tola was not going to let that happen. He and Ethiopian Trials champ Yigrem Demelash worked together to keep the pace somewhat honest, clicking off a pair of 65’s, before the race’s first dramatic moment occurred on lap 10. 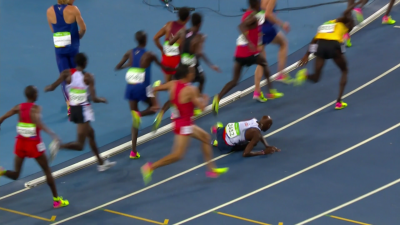 Farah was near the front of the pack, just ahead of Rupp, when the two men tangled on the turn and Farah hit the track. Farah got up quickly and lost roughly 20-30 meters. 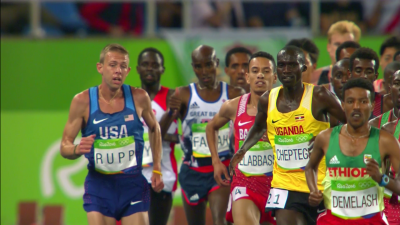 Rupp, concerned for his some-time training partner, began looking back repeatedly on the homestretch to check on Farah, slowing himself deliberately in the process, and Farah gave him a thumbs up sign. 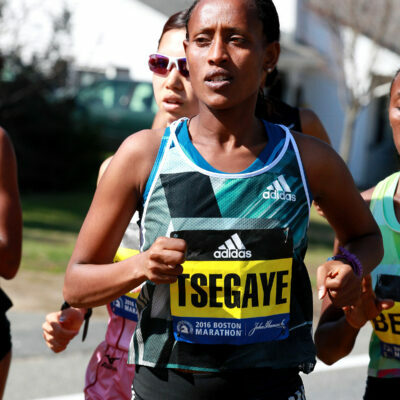 The Ethiopians, who had picked up the pace to a 63.9 on the previous lap, were oblivious and did not try to capitalize by pushing the pace up front. Tola led the field through 5k in 13:53 and 300 meters later, Tanui moved into the lead, followed by the other Kenyans, Kamworor and Bedan Karoki, plus Farah. Would the Kenyans try to hammer it home from here? Tanui dropped a couple of 65’s, but at 6k (16:37.20) the lead pack consisted of a massive 17 people — and it was growing, as the chase pack was actually bridging the gap to the leaders. Tanui and Karoki worked together over the next few laps as the pack began to string out, but they slowed again on lap 18 (66.8). That’s when Demelash decided he had had enough and launched into his long drive for the finish. He dropped a 62.6 on lap 19, the fastest of the race to that point, and the contenders were beginning to separate themselves from the herd. Another 62 brought them to a mile to go, and at that point the lead pack had been reduced to five men: Demelash, Tola, Tanui, Farah and Rupp. 2014 world junior champ Joshua Cheptegei of Uganda was a few meters back, with Karoki a few more meters behind him. 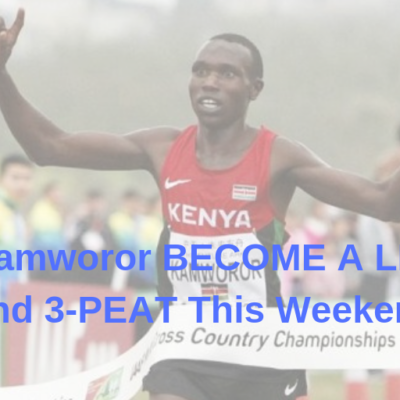 Kamworor, looking like a shell of the man who gave Farah all he could handle in Beijing last year and spanked him at the World Half Champs back in March, was off the back and would play no further role. Demelash continued to press with a 62.7 before Farah moved to the front with 1k to go. He kept it rolling the next two laps (62.8, 61.2) and hit the bell in the lead with Tanui on his shoulder and Rupp directly behind him in third. Tola sat on Rupp’s outside with Demelash slightly behind the four of them. 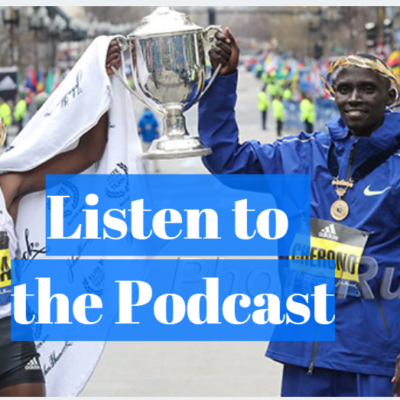 Tanui made a hard move with 300 meters remaining and though Farah allowed him to go by, he stuck close — a favored tactic of the Brit’s in recent years. Tola moved into third as Rupp reached down for his kick. But nothing was there. The medals were slipping away. Tanui sprinted around the final turn, but he still could not shake Farah, who swung wide entering the home stretch. 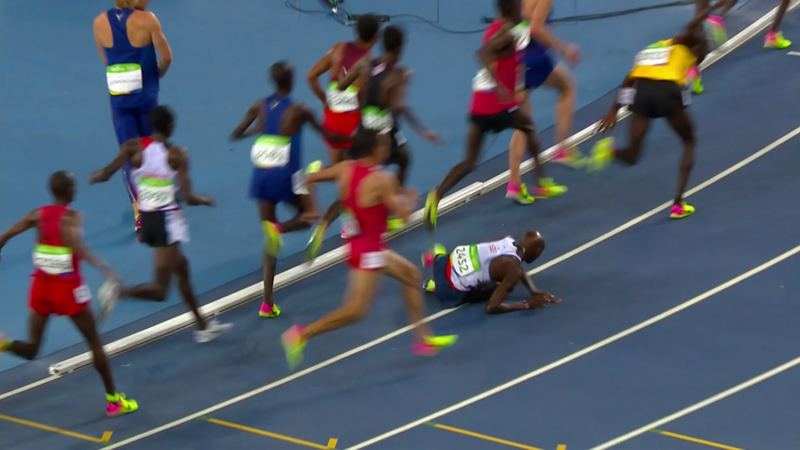 Farah moved into the lead without much trouble and moved directly in front of Tanui, forcing the Kenyan to move either inside or outside if he wanted the Olympic title. But as Farah reached top gear, Tanui just could not make up the ground. Farah held him off to repeat as Olympic champion, his final lap covered in 55.37 seconds. Though that was far slower 53.48 he ran to win this race in London four years ago, the final 5k — roughly 13:11 for Farah — was much, much faster. Despite hitting halfway in 13:53, Farah ran a quick 27:05.17 and came just four seconds shy of breaking Kenenisa Bekele‘s Olympic record. Tanui got the silver, though the battle for the bronze was tight all the way to the finish, with Tola barely holding off the late charge of Demelash by the narrowest of margins, 27:06.26 to 27:06.27. Rupp, knowing he was defeated in the final straight, slowed over the final few meters and crossed the line dejectedly in fifth place before falling to the track. The men who have won two Olympic titles are some of the biggest names in the history of distance running. Only five men, counting Farah, have successfully defended their Olympic 10,000 title. That being said, it’s been happening a lot lately as someone has been winning or repeating as 10,000 champ for each of the last six Olympics. Kenenisa Bekele (2004 and 2008. “I was thinking don’t panic, don’t panic, don’t panic,” Farah said. “At that point mentally, I was thinking, ‘Is the race done, is the race done?’ and I was telling myself ‘No, no, no, I worked too hard for this.’ I promised my daughter Rihanna I was going to get a medal and I wasn’t going to let her down. Farah said he he had promised Rihanna a medal here, because in London 2012 he dedicated his two Olympic golds to his soon to be born twin daughters. Farah: Obviously, you know it’s a small sport… There’s so many athletes by getting pictures of them — obviously you’re taking a picture, you’re not going to say no, are you? So it doesn’t mean you train with them. EPO was found at the hotel that Aden and his athletes were staying at in June, and Aden has been under investigation by the IAAF for the past three years, though he has not been banned. Farah has said in the past that Aden is not his coach, but he has often trained and eaten with Aden’s athletes during his training stints in Ethiopia, which naturally has some journalists such as McKenna curious about how deep Farah’s connection goes. Quick Thought #4: Rupp shouldn’t be hanging his head about failing to repeat as a medalist as it’s very hard to do. Tonight, Rupp was trying to become the first American with multiple Olympic mid-d or distance medals since Kim Gallagher in 1988, the first man since Frank Shorter in 1976 and only the fourth American period since World War II. Rupp did not join them tonight, but he has another chance in next week’s marathon. The race was essentially a re-run of last year’s World Championship final in Beijing. Though the race closed harder tonight (splits of 13:40/13:21 for the leaders in Beijing vs. 13:53/13:12 tonight), Rupp was in the same exact position: in a pack of five men at the bell. And once again, once the eventual medallists took off with 300 meters to go, Rupp could not respond and had to settle for fifth place. Rupp said that his marathon training this year may have impacted his ability to close but that from the Olympic Trials until now, he’s really been working on his speed. Rupp said it will probably take him a day to get over tonight’s result, but then he’ll be 100% focused on next Sunday’s marathon, which offers an opportunity at redemption. Quick Thought #5: What happened to the Kenyans? One Kenyan, Paul Tanui, deserves major props. He’s now medalled in three straight global championships over 10,000 meters, and his silver medal tonight was the greatest accomplishment of his career to date. The other two, Geoffrey Kamworor and Bedan Karoki, will be leaving Rio wondering how it all went so wrong. We did not get a chance to ask them directly (both declined to speak to us in the mixed zone) but these clearly were not the same runners who took it to Mo Farah in Beijing last year or Cardiff this year. In retrospect, the results of the Kenyan Trials presaged what was to come in Rio. 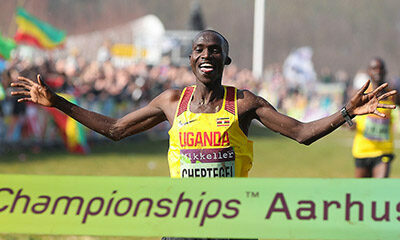 Tanui ran great, 27:46 at altitude to win by 11 seconds as both Kamworor and Karoki dropped out. Karoki and Kamworor finished the race tonight, but if you told us they would finish 7th and 11th, we wouldn’t have believed you. 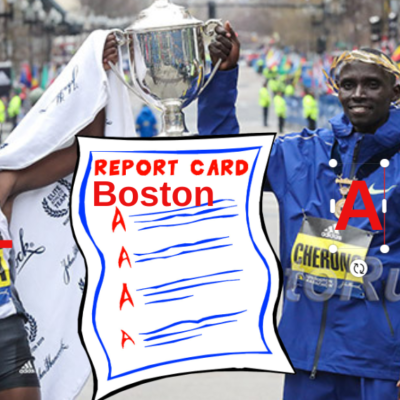 Korir was pleased with his result today, especially considering he missed five months of running due to his military training in the U.S. Army, which concluded in January. Korir did some running with his unit while he was stationed at Fort Leonard Wood in Missouri, but nothing that would help him maintain fitness — a mile or two at 11-minute-mile pace. But he got back into training in February and has rounded into shape nicely. He’s clearly a lot fitter now than he was in April at Stanford, when he ran 27:58, and being able to focus on running full-time via the Army’s World-Class Athlete Program should allow him to reach greater heights in 2017. Congratulations to Zane Robertson @runninelvis for smashing my NZ record in the 10,000m in Rio. Great effort proud of your performance. We had an agent tell us anonymously today he felt the drug situation in Kenya changed a lot the last five years with the mentality being drug use is necessary on the roads and that there are a few Kenyan doctors who peddle the drugs to make more money from athletes. Former Northern Arizona University star David McNeil was 16th in 27:51.71. He was pleased with the result and effort. 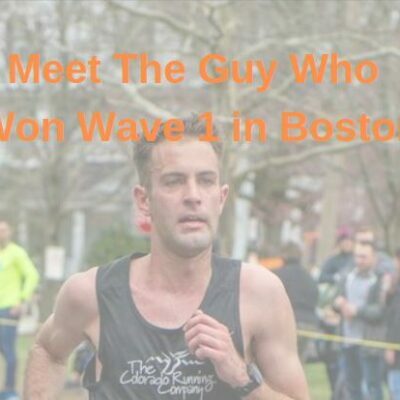 He said his coach told him to “run something you can finish and you can be proud of.” David said, “I’m definitlely proud of that,” noting that he got a stich early on but battled on. He “lost a little confidence” the last 5 laps, but overall had a solid race. Up next is the Amry 10-Miler road race in October which should be a great one with four US Army track distance athletes on Team USA in Rio.